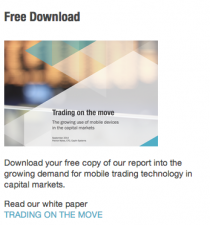 Great survey from Streambase, showing how buy and sell firms are using CEP technology within their FX business. As expected, for buyside firms the key is to generate Alpha seeking strategies (looking for trading opportunities), whilst for sell side firms, it’s all about managing the resulting risk, through smart order routing. It’s also interesting to see that in terms of execution, 55% of respondents executed their trades through Single Dealer Platforms, compared to 44% who used multi-Dealer Platforms.